GREY DECK CLEANER is a powerful oxalic acid wood cleaner and deck wash. It’s ideal for cleaning grey or blackened timber caused by weathering and mould. It can also remove light stains from dirt and iron without damaging the timber. The result is a clean timber surface ready for oiling with Aussie Clear or Exterior Pine Clear. 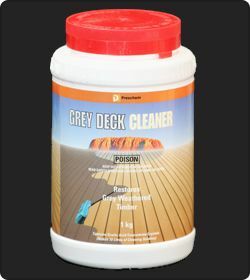 GREY DECK CLEANER is ideal for use as a deck wash for cleaning grey or blackened decks and all other exterior woodwork. It can be used to remove iron staining provided that any iron particles have been sanded out. It is suitable for use on all timber species such as Ironbark, Merbau, Spotted Gum, Western Red Cedar and Treated Pine to name a few. Timber which has been previously coated with pure Linseed Oil or some other similar finish, may require vigorous scrubbing with Oxalic Acid to clean off the discoloration caused by mould. Dissolve 500 g of GREY DECK CLEANER in 5 litres of water (i.e. a 10% solution). Using a stiff brush, clean weathered timber using the mixed solution. Wash the timber down thoroughly afterwards with water or a high pressure cleaner. This process may have to be repeated for timber that has weathered for some time. Ensure timber being cleaned is allowed sufficient time to dry before application of oils or paints. Grey Deck Cleaner is packaged in 1kg plastic jars. The oxalic acid crystals are poisonous and are corrosive to the skin and eyes, wear gloves when handling the crystals and the diluted solution. Avoid contact with skin. Do not spray the solution, as the mist is a severe irritant to the respiratory tract. Store in a cool dry place and out of direct sunlight. Store away from oxidising agents and food stuffs. Was contaminated skin with plenty of water. Irrigate eyes with copious quantities of water for at least 15 minutes. If ingested give water to drink. Do not induce vomiting. Seek immediate medical assistance. CAUTION: Reacts explosively with strong oxidising materials.